That’s right. Get me in a foreign country renowned for its baked goods, and I’ll bake cupcakes that look like they came straight out of an all-American Martha Stewart cookbook. After baking wedding cupcakes, I swore cupcakes off for, well, ever. Those suckers are so cloyingly sweet that I predicted my making them again would result in a lengthy sugar-induced coma, followed by my dramatic demise, frosting oozing out of every pore. I mean, I had nightmares about the last cupcakes I baked. I desperately want to move on to a new baked-good food trend–perhaps whoopie pies, or macarons. Sometimes, however, my cupcake reputation precedes me. Or, as in this instance (and many others, frankly), I could not keep my mouth shut and, one afternoon, out poured my admission: I was in a class where my nickname was Cupcake. My cupcakes have won awards. My cupcakes bring all the boys to the yard. Et cetera. This admission was followed by a shocking revelation: my family didn’t know what a cupcake was! As a self-assigned American Ambassador to Germany, I could not allow this ignorance to continue. Sure, the country already has yeasty soft pretzels, vibrant fruit tortes, and, my personal favorite, nuss-nougat croissants, but without cupcakes, Germany is a country still lacking in the ultimate vehicle for carbohydrates, butter and sugar. Thus, I found myself baking cupcakes for one of my German family member’s birthdays. As much as I gripe about baking yet another dozen cupcakes, I derive great pleasure from the oohs and aahs that my cupcakes always elicit. Somewhere around the time that I take those little cakes out of the oven, they transform from the bane of my existence into my personal pride ‘n’ joy. Piping frosting on them is the closest I’ll ever get to being an artist. My friend Kasey discovered this buttercream recipe, so I finally have a strawberry frosting I can be proud of, unlike last time. The recipe actually is Martha Stewart’s strawberry meringue buttercream, though I changed the wording in the directions to better represent how I interpreted the recipe, and included the European conversions I needed to make since I now lack proper measuring cups. I used the same chocolate cupcake base I always use. Even I enjoyed the result of this cultural immersion experience. But, seriously, I need to learn how to make nuss-nougat-filled croissants before I ever delve into cupcake-making again. Recipe suggestions welcome! 2) Slowly combine butter into the egg mixture a few tablespoons at a time, beating well between additions. Add vanilla, then stir in strawberry jam puree until the frosting is smooth. This recipe always reminds me of my high school graduation. My mom made it for my party since I raved about it constantly. For the record, my college graduation is 39 days away. It’s simple, sweet and ideal for a spring/summer dessert, served warm with ice cream or whipped cream. It’s also wonderful for breakfast, served cold. I use Whole Foods’ frozen mixed berries in mine, but only until I can find some fresh, local berries! Besides making this cake this weekend, I also filmed a video for a contest I’ll tell you all more about Monday. In the meantime, I’d really appreciate it if you could vote for my friends‘ video. I’m making the cupcakes for their wedding–we had a tasting this weekend that was divine. Simply click here and click the thumbs up. Aren’t they precious? 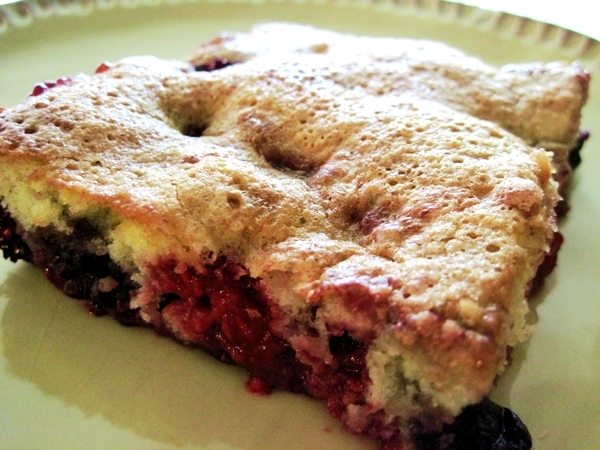 1) In a 9 x 13 cake pan, evenly spread fruit and pour 1/4 cup sugar over the berries. 2) Stir the eggs, oil, orange peel, vanilla and remaining 1 cup of sugar in a bowl. Slowly whisk in the flour and baking powder. 3) Pour batter over the berries and gently spread to cover berries. 4) Bake at 350 degrees until top springs back slightly when pressed in the center (about 45 minutes). As I mentioned, I set aside a few chocolate cupcakes on which to perform experiments of a sweet ‘n’ sinister nature. Well, consider this second post a crucial feature of any food blog: food failure. 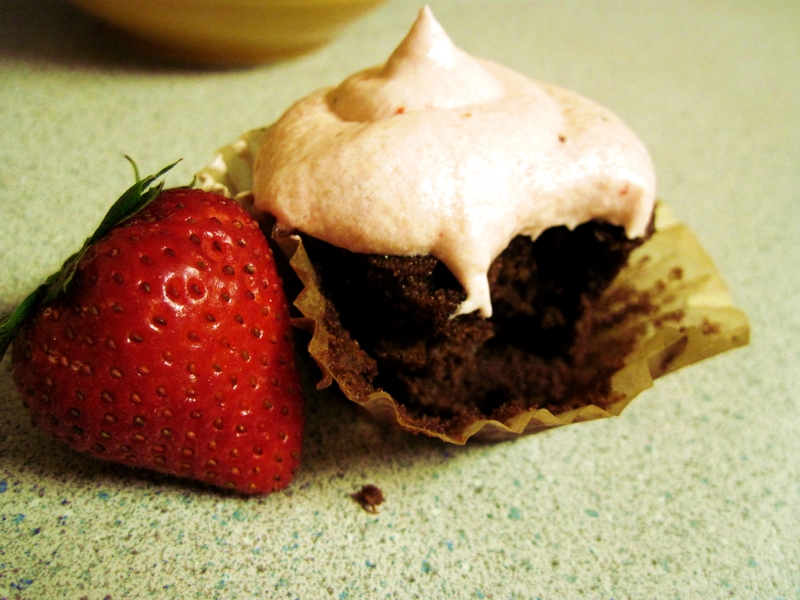 I envisioned a chocolate-covered strawberry in cupcake form, a la Hello Cupcake‘s “Prima Donna.” My results were more akin to a faintly pink, sugary, semi-liquid mess. Like my face at our midnight breakfast, post-prom. 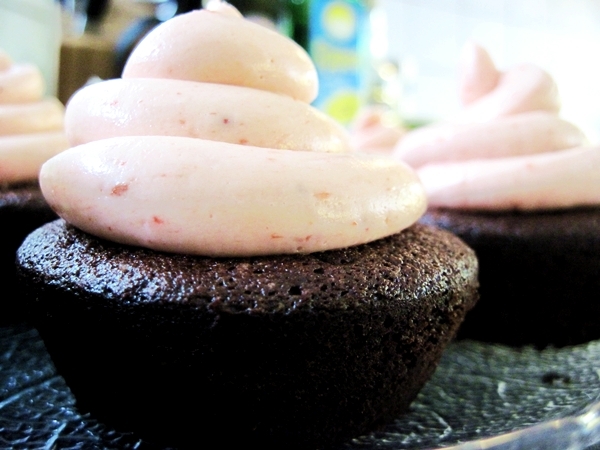 I used the same buttercream recipe, but substituted the mint and milk with a few tablespoons of pureed strawberries. Too much liquid, not enough thickener. (I added meringue powder, to no avail.) And yet, despite the puree overload, the flavor wasn’t nearly intense enough. I’ve tried strawberry jam in the past, but it’s equally disastrous and even more sweet. 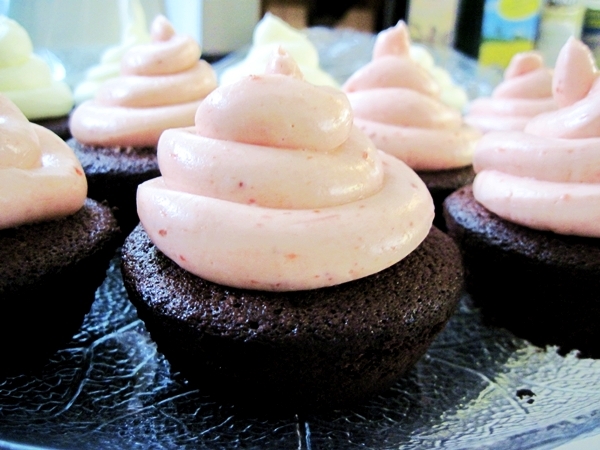 Does anyone have a strawberry frosting recipe that doesn’t melt under pressure?